Simply Deeptima | Beauty and Lifestyle Blog: Contest Update : Win a chance to watch LIVE Lakme Fashion Week. Contest Update : Win a chance to watch LIVE Lakme Fashion Week. i received an email on behalf of Hindustan Unilever Ltd.and am so happy to let you all know that now you all (not just the 4 winners of the phase 1 contest) can stand for a chance to watch live Lakme Fashion Week. Participating in this contest is really easy and fun , you just have to do what you like the most.... 'Getting Dolled up ' (i assumed it as you are on this blog). Anyone for any age group can enter this contest. So quickly lets look into the rules and procedure to enter. Make sure you send atleast one full face picture with the Lakme CC cream in the frame. 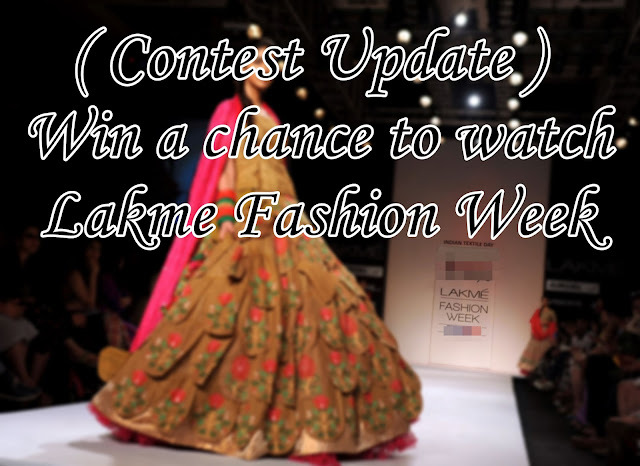 All valid entries would be email to HUL for judging, and one winner will get a chance to watch Lakme Fashion week LIVE !! I decided to pick another winner by myself, and my favorite look would get small surprise gift (obviously makeup :P) from my end. In case you have any queries or i missed out on any point, just leave a comment below and i'll update you on the same. I know 1 week is not enough but don't waste time and pull out your makeup brushes and Lakme CC cream and get creative !! Labels: Contest Update : Win a chance to watch LIVE Lakme Fashion Week, Free makeup, Makeup Prizes. anyone on your blog got their kits? I din't gOt till now..